The #ChicagonistaLIVE show kicking off the year with style at Bryson Milan! 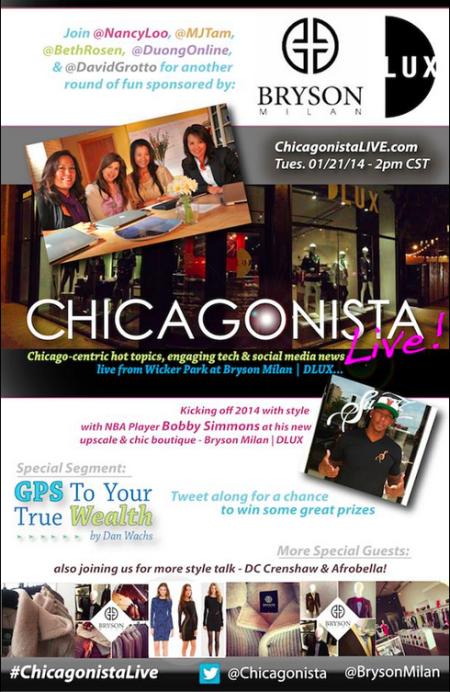 The #ChicagonistaLIVE show will be broadcasting live at Bryson Milan | DLUX this coming Tuesday, January 21st and the new upscale boutique owner and NBA Player Bobby Simmons will be joining the show. 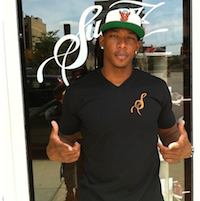 Simmons is a Chicagoan that last played with the LA Clippers and will not be only touring us in Bryson Milan but he will be talking about his journey in to a successful entrepreneur in the fashion industry. Also joining us talking about trends and more are some of Chicago’s style makers and trailblazers, D.C. Crenshaw and Afrobella. 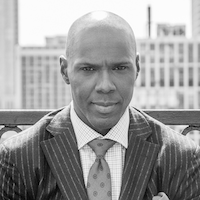 D.C. Crenshaw is a food and lifestyle personality and a two-time Emmy nominated TV Host/Executive Producer. He created Game Time Dine, a TV show that featured athletes and celebrities talking food, sports and fun. He played in the NFL with the Detroit Lions, a Ford Model, and busy dad of 2 boys. 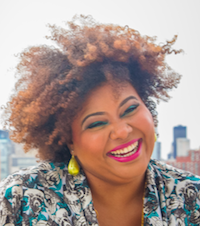 Trinidadian writer Patrice Grell Yursik created Afrobella.com, the first blog to celebrate natural hair and beauty in all skin tones and sizes. She is nicknamed the Godmother of Brown Beauty Blogging.Afrobella has been featured in the New York Times, Chicago Sun-Times, Essence, Glamour and Fast Company. In 2011, she partnered with MAC Cosmetics to create a limited edition lipglass — it sold out in a week! She has covered New York Fashion Week, BET Awards, and the Oscars, and was listed in Ebony Magazine’s Power 100. GPS To Your True Wealth is back again on our monthly money management segment. From fashion and now to finance, Dan Wachs Atrium Wealth Advisors will be talking about Unexpected Detours and will be mapping you the routes in to more comfortable living and that could more shopping. That’s more money on the side to splurge in Bryson Milan! Watch and join the conversation. Tweet along with #ChicagonistaLIVE during the show for a chance to win some prizes.